Make Your Choices for the 2015 Blind Spots Series! One of my main reasons for starting this blog was to fill in the gaps in my film knowledge. The marathon structure allowed me to dig into zones that I’d hesitated to touch in the past. While the site’s format has evolved during the past few years, that goal is still part of the overall mindset. I’ve found the monthly Blind Spots Series helpful in ensuring that I’m catching up on movies that deserve my attention. I’ve participated in this project for the past three years and taken a different route each time. Last year, I stole Ryan McNeil’s idea to have the readers select their choices from a predetermined list. It worked out really well last time, so I'm doing the same thing again for 2015. While his options this year were extensive, I’ve restricted mine to 50 films. Without choosing the exact selections myself, this approach allows me to shape the general theme of the list. I’ve spent considerable time recently pondering the goals of this site and what I’d like it to be in the future. This process has impacted the options developed for this series. For the most part, I’ve chosen movies that excite me and aren’t included to check a box. Some are genre films that would make few people’s lists of their favorite movies of all time. I don’t think the Action Jackson and Commando will be making the Sight & Sound list in 2022. It’s a diverse group from around the world that should lead to an entertaining ride each month. There are classics in the mix like Man with a Movie Camera, Patton, and The Great Dictator. None of these sound like work, which is the key. I’ve also incorporated genres where I’m still behind like musicals, horror, and animated films. Review the list of 50 films on Letterboxd. Choose 12 movies that you believe I must watch next year. Vote in the comments section on Letterboxd or in this blog post. The voting will remain open for several weeks to allow you enough time to make your choices. I’ll announce the 2015 list in late November and start preparing for another strong year of movie watching. It won’t be easy for the new crop of films to live up to the 2014 selections. You should also be sure to check out Ryan’s monthly compilations of bloggers’ posts in the ongoing series at The Matinee. The participation continues to increase, and it’s interesting to note how differently each writer approaches their blind spots. Thanks in advance for your assistance in this venture! Check out all the posts from the 2014 Blind Spots Series by clicking here. Joel, I'm sorry to report that you're still the only person who's picked Action Jackson. I always hate it when people are like, "What? I can't believe you've never seen _____!" But how did you escape childhood without seeing the original TMNT?! So that's my first choice. I haven't seen many of the others, or else I wouldn't recommend them, so perhaps I should start a Blind Spot series of my own! I just finished finalizing my list which I will reveal later this month. Hi Dan! 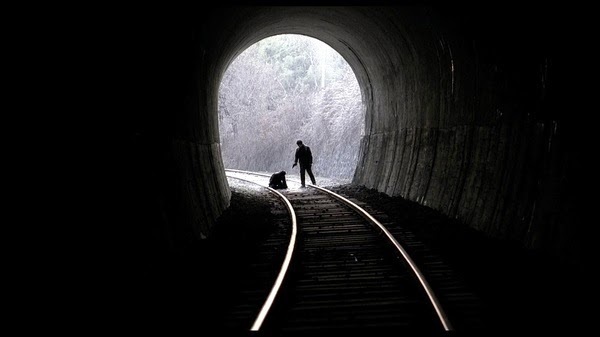 There are so many I haven't seen either from your list, but hey you should watch Following if you've seen a lot of Nolan's films. It shows his intriguing storytelling style even w/ a shoestring budget. Hi Ruth! Following isn't getting a lot of votes, but I'm sure that I'll catch up with it soon. Just made the answer on your letterboxd! Here are my picks - I've only seen just over half of your list, but that still gave me some good stuff to choose from! Dirty Dozen, Dirty Dancing, Green Mile, Wait Until Dark, Midnight Run, Nightmare before Christmas, and I love TMNT but it's SUPER dated. It breaks my heart that you haven't seen Pink Floyd's The Wall OR The Outlaw Josey Wales. BREAKS it. So, along with those films, I've listed below (in order of preference) my 12 votes for your Blind Spot series. Man with a Movie Camera, Patton, The Nightmare Before Christmas, Suspiria, The Great Dictator, THX 1138, Dune (not a fan, but I'd be interested in your thoughts), Kiss Me Deadly, Playtime, The Killers, Carrie, Z. Do you know anything about the plot of The Crying Game? Joel, I do know the big twist from The Crying Game. I've heard that it's a good film beyond the twist, and I've liked some of Neil Jordan's other films. I don't think it's going to make the cut, though. The Man With The Movie Camera - simply one of the most creative approaches to documenting a city, humanity and fimmaking in general. One of the greats. The Towering Inferno - 70s disaster fun. When they blew up a room and soaked the characters with tons of flowing water, they actually blew up a room and soaked their actors with tons of water. The Dirty Dozen - Manly men doing manly things in manly ways. Lee Marvin and crew chewing the scenery and spitting it right back out on the ground. Fun stuff. Woodstock - A document of the times like no other. And damn if that Santana performance isn't one for the ages. Suspiria - I just wrote a few rods about it here and I think that captures why I think it is so brilliant. Pulse - A film that will ever so slowly curl you up into a ball of quivering flesh. No jump scares, but soaked with dread as humanity slowly wipes itself out. The Haunting - One of the best haunted house movies ever. Kiss Me Deadly - An almost perfect summation of everything Noir. Playtime - I just simply adore everything about this film. The look, the design, the gentle humour and its overall message. Z - Top notch thriller. My strongest recommendations are for Pink Floyd The Wall and The Nightmare before Christmas. Also I'd vouch for Suspiria.The story is silly, but so what; it looks gorgeous and the soundtrack is haunting. Saturday Night Fever, The Green Mile, Rambo First Blood and The Curious Case of Benjamin Button are other movies I'd check out if I were you. This list is purely selfish, since I will be watching most of these with you. Thanks to everyone for submitting their picks so far! I'm going to leave the voting open until Monday, then I'll announce the films that made the cut. Oooh, fun. I dig the diversity in the options.